George Gurney, the nationâ€™s foremost expert on American sculpture, is retiring after more than 36 years at the American Art Museum. He will be greatly missed, as a curator and friend! But before leaving, he gave a farewell tour of the museum. Three and a half decades adds up to a lot of interesting stories. "Sculpture is tricky business," Gurney told us, "It takes time to make...and move, takes time to show, and any conservation takes time." As he touched on some of his favorite works of art, Gurney commented on the roles of curator, collector, and (winner of the unsung hero award?) the conservator. "I'm going to concentrate on what I've actually purchased and added through gifts to the collection," he told us as we made our way to the second floor of American Art. Gurney's first stop was one of his earliest purchases for the museum, Will 'O the Wisp by Harriet Hosmer. This marble work, a little shy of three feet, rests on a pedestal, as does Hosmer's other work, Puck right across the hall. Puck was an enormous success, and a hit with the British aristocracy and foreign nobility, causing the crown princess of Germany to remark, "Oh Miss Hosmer, you have such a talent for toes." Puck made "bucketfuls of money" for the sculptor; Will 'O the Wisp, not so much. Puck came to American Art in 1918; Will 'o The Wisp in 1987. "I like to buy things that are unique," Gurney told us, "putting the two together made sense as the artist meant for them to be seen that way." The tour continued with Boy with Broken Tambourine by Thomas Crawford from 1854. At the time of the purchase of this sculpture, 1990, Gurney was working on an exhibition titled, Images of Innocence that dealt with the depiction of the child in 19th century art. "Why did I buy it?" Gurney asked, then answered, "Because Crawford started doing monumental works such as monuments of George Washington, so the little things are kind of scarce." That led to another point of curating: "We have this, this, and this, but what are we missing?" 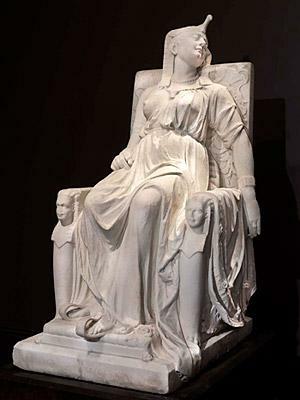 We moved onto other interesting works, but none with as rich a backstory as The Death of Cleopatra by Edmonia Lewis. The sculptor, born in Albany, New York of African American and Chippewa descent, carved the work in 1876. (When living in Rome and flourishing as an artist, she became friends with Harriet Hosmer.) "In the mid-1980s," Gurney told us, "we learned that Edmonia Lewis's most important sculpture was found in Chicago after being missing for a century. She was important because she was the first African American and Native American female, neoclassical sculptor, and this was her major work." And so the detective work began. Apparently, during World War II, the sculpture was in a race track in Forest Park, Illinois, sitting atop the grave of a favorite horse named Cleopatra. The grounds then turned into military housing and was used for children's games (apparently Cleopatra doubled as home base for games of tag) before becoming a shopping mall. Cleopatra was then moved to the work yard of the developer who built the mall. In addition, the Italian marble was painted over by a troop of well-meaning Boy Scouts. Later on, it became under the purview of the Forest Park Historical Society, who thanks to Gurney, donated the sculpture to the museum. And with the help of conservators, The Death of Cleopatra, was restored to its near-original state. Appropriately enough for a farewell tour, when Gurney showed us The Lost Pleiad by Randolph Rogers he told us, "We purchased this fifteen years ago, and today is the first day that it's been on view all day." The sculpture needed to be conserved but had been on the back burner for a while. "Fifteen years ago I told the conservators that I wanted the work done before I retire. And they did." The sculptures that George Gurney spoke about are on view on the second floor of American Art. Thanks to his careful curating, the museum is a much richer place.